Starting your own business is a major project. Jennifer Bridges, PMP, shows you the five things you’ll want to think about before you start. That means before you start, you need to know where you’re going. First you have to have the thought, which means a mental creation of what it is you’re going to do. Then comes the second part, the physical creation of that thought into reality. What that entails is making a plan and using that plan as a guide to take action. The plan should have five pillars on which it stands in order for it to be viable. Health Insurance: The first thing you need is coverage for both yourself and your employees. Know whether the company is just you and needs an individual plan or whether you’ll have employees and require group coverage. Taxes: It’s one of the two things that everyone must deal with, and new businesses are no different. You might have corporate taxes or, if you’re selling a product, sales taxes. There’s city, country and personal taxes to consider as well. Seek the help of a professional, such as a certified public accountant, to help you with corporate structure. Legal Liability: This is again an area where you’ll want to seek counsel to make sure you’re not opening yourself up for a lawsuit. There are different ways to approach the legal issues of a new business depending on whether you’re a large corporation or a small business, a non-profit or working with the government. Income Fluctuations: It’s important to know the cycles in your business, so you can plan ahead. Some call this seasonal, knowing when during the year income spikes and dives. Make sure you have the right resources to handle the influx or reduce them when there’s a lull. Accounting & Bookkeeping: It’s already been noted how important accounting is for the other steps in starting a business. Once the business is up and running, though, the issue remains. Accounting and bookkeeping are crucial to keep your records in order in case you’re ever audited. Lastly, Jennifer offered some tips. Find champions and/or mentors to help chaperon you through the process, ideally people who you trust, respect and have experience doing what you’re about to do. They’re a great resource to help you over those inevitable humps in the path to launch. Set realistic expectations for both yourself and your employees, and especially your clients. Get into good habits early. The stick. Don’t fear delegating. You can’t do everything yourself and you shouldn’t. There are people on you team hired for specific tasks, let them do what they’re good at. Read our 7 habits of successful project managers for more tips. Be aware of the lifestyle that suits your work habits, be that an open office setting, remote work or whatever it is that makes you and your employees excel. Pro-Tip: Once you got your business started, then it’s time to grow. Growth strategies include new markets, expanding within existing markets, product expansion, diversifying and acquiring. It’s never too early to strategize. Basically, before you even start, you need to know where are you going? Franklin Covey talks about two things, a mental, first creation, and the physical, second creation. The first one is thinking about it and the second one is physically taking action. So, we wanna build a plan and take action. So, here are a few specific actionable things to think about and take action on first. Number one is health insurance. Well, currently, we’re in open enrollment, so people think about, “If I start my own business, is it going to be just myself or is it going to be myself plus employees?” Because that determines, are you looking at individual plans or group plans? So, you wanna make sure you know what the options are and that you do have options to cover yourself and your employees appropriately. Then also, you wanna be sure to think about all your taxes and here’s where working with a CPA or an accountant helps. You wanna think about what are my corporate taxes? Any sales taxes? If you’re selling products or services, is there any kind of sales tax? If you have an online business, are there any online sales tax? You also wanna look at, are there any city or county taxes? And how does that impact your personal taxes? And also, we wanna look at the legal liability. So, depending upon if you do work for large corporations or small businesses, those two different groups have different expectations or requirements for legal liability. You also wanna look at, are you doing work for maybe a government or any kind of nonprofit organizations? They each have different legal requirements. So, both the taxes and the legal liabilities are governed under what type of corporate structure? Again, I highly recommend working with a CPA, your accountant, and your attorney, a corporate attorney to ensure you get these levels correct. One of the fallacies I see is when people don’t go and get advice and they get in trouble somewhere down the line. So, again, when we look at corporate structure, we’re looking at do we need to be an S corporation or a C corporation? And look, it depends on what type of stock you have in your company. Also, an LLC is a limited liability corporation. So, again, depending upon what type of organizations, what type of work really governs the structure. We also wanna look at income fluctuations. You wanna know what the cycles are in your business so you can plan ahead. Some people call those seasonal. Sometimes there are different periods of the year where the work spikes, so you have to consider, do I have enough capacity on my own or my employees to handle the work. And if the cycle goes down, what do I do if I have employees? Do I have enough work to keep them going? So, those are some of the things we wanna plan for. And also, it’s really important to have an accounting or bookkeeping firm helping you either set up the book so you can do them yourself or I highly recommend delegating that to a firm for people who do that day to day to ensure number one, you’re coding entries correctly, you’re invoicing correctly, and keeping your books ready just in case you’re ever audited. So, here’s some tips. Number one, find your champions, people who believe in you, believe in what you’re doing, mentors, people who have been there, who’ve done that, and what you’re trying to do so they can guide you along the way. Set specific expectations, not only with your clients who you’ll be doing work with, but also if you have employees. And then, I say habits. This one is, build good habits first. The things you start doing from the beginning of your company, kind of carry on. So, you wanna start good habits like paying yourself first, putting some money back, setting up your books, and running your operations correctly from the beginning. You also wanna learn delegation. Delegate things that are not your strong points. Do what you do well and delegate things to others, like maybe accounting, bookkeeper, legal contracts to others who do that best. And then consider your lifestyle. When people are working and start their own business, consider if you like working with people, maybe being on a corporate site, or being in groups, or do you work better or are you more productive working remotely by yourself? 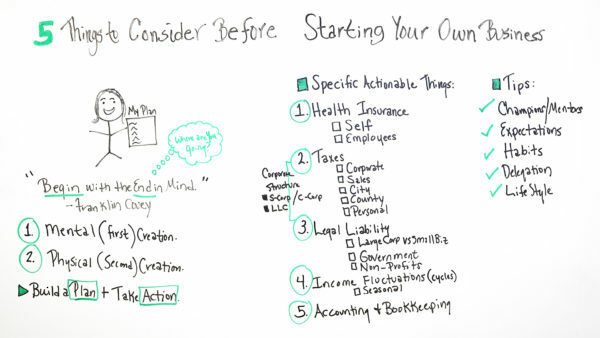 So, these are some of the tips and some of that actionable steps to take when you start your own business. And if you need some additional resources, then sign up for our software now, at ProjectManager.com.